Given the abundance of food and the lack of eaters, the first course was dropped, the dessert postponed until the next day, and the cheese plate consumed several days later as a light supper. We elected to pour all of the wines at once (yes courses can go, wines cannot!) which allow each of the wines to pair with each of the courses, even if they were not anticipated to pair well. We used a recipe from http://germanfood.about.com/od/soupsandstews/r/Cold-Cherry-Soup.htm for the soup. Canned sweet cherries substituted for the fresh, a tart cherry juice was used, and a walnut liquor (Nocello Walnut) replaced the suggested amaretto. The Block 478 pinot was used for the red wine. Although the wine was inexpensive, it was surprisingly good. Not unexpectedly, it paired best with the very sweet but satisfying cold soup. The sweetness clashed with most of the other wines leaving them hard and bitter. 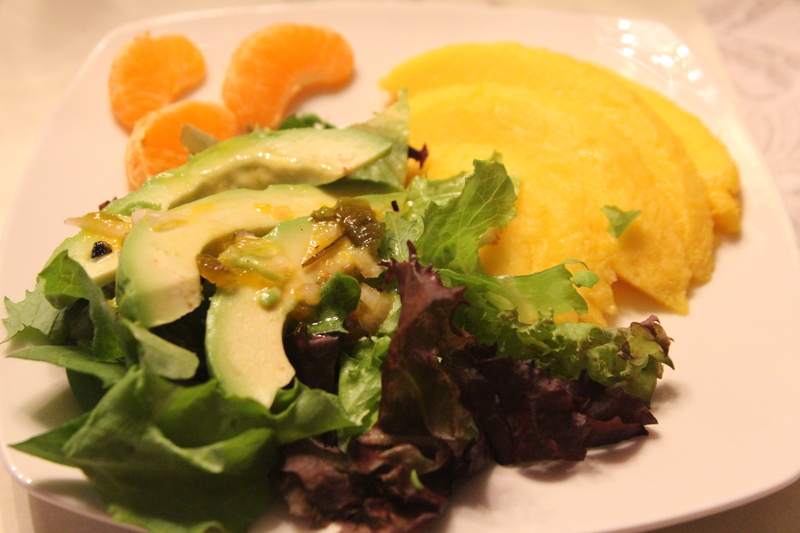 dressed with a jalapeno/tangerine vinaigrette(http://www.bonappetit.com/recipe/avocado-and-tangerine-salad-with-jalapeno-vinaigrette). The slightly spicy dressing provided an interesting depth to the dish and paired best with the Riesling. Originally, the dish was to included garlic beans but this was dropped. Although this diner-type dish is not what we usually include in these dinners, given that the appetizer were (supposed to) be deep-fat fried, I though this might be fun. Since this was our first experience making them, the croquettes were made exactly according to the recipe (http://www.foodnetwork.com/recipes/chicken-croquettes-recipe0.html). Although OK, these were nothing to special. Should we ever make again, there are several modifications that I would try to deal with the relative blandness. First, addition of minced onions/shallots to the batter would be good, along with a little spiciness such as Ancho powder or crushed red peppers. 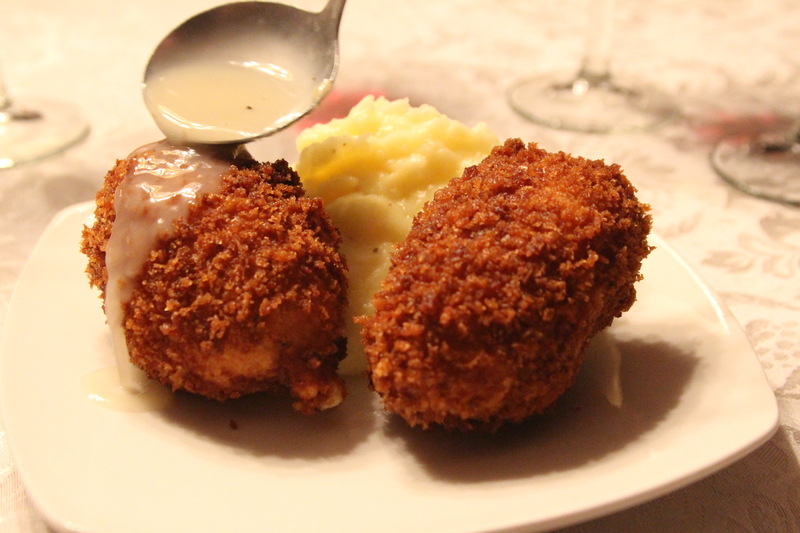 Second, the recommended 3 ounce size for the croquette got the inside of the football-shaped croquets only lukewarm when the crust was a golden-brown. I would consider decreasing the size of each piece and perhaps forming them into a more “rope-like” shape. The suggested gravy was tasty but thin and very pale. I would consider a more tradition roux cooked to a darker hue and relatively more roux to liquid. The garlic mashed potatoes were from an Alton Brown recipe (http://www.foodnetwork.com/recipes/alton-brown/creamy-garlic-mashed-potatoes-recipe.html). There was little new about this recipe except that the garlic was added to the cream rather than the potato cooking water and it did not use butter. These were some of the most garlicky mashed potatoes (hmmm) I have had and were rich even without the addition of butter. Both of the white wines paired well with the dish. 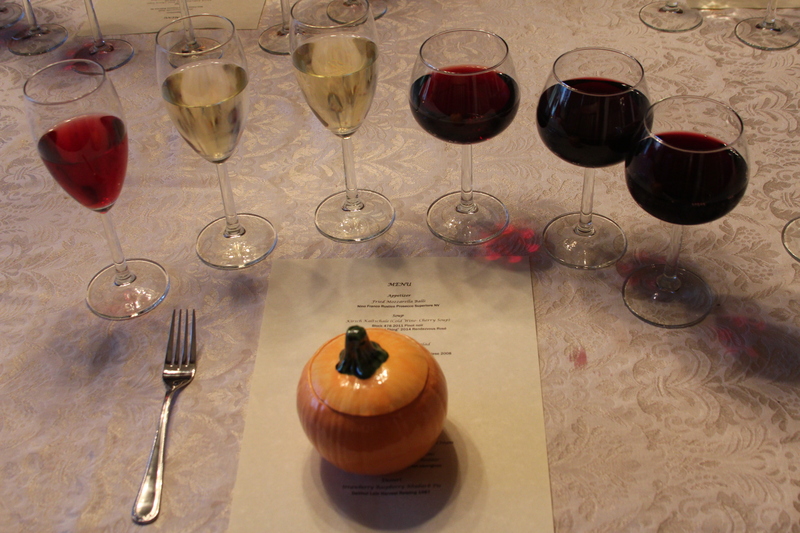 The stand-out pairing was the Riesling. preheated 450 degree oven to bake for about 25 minutes. 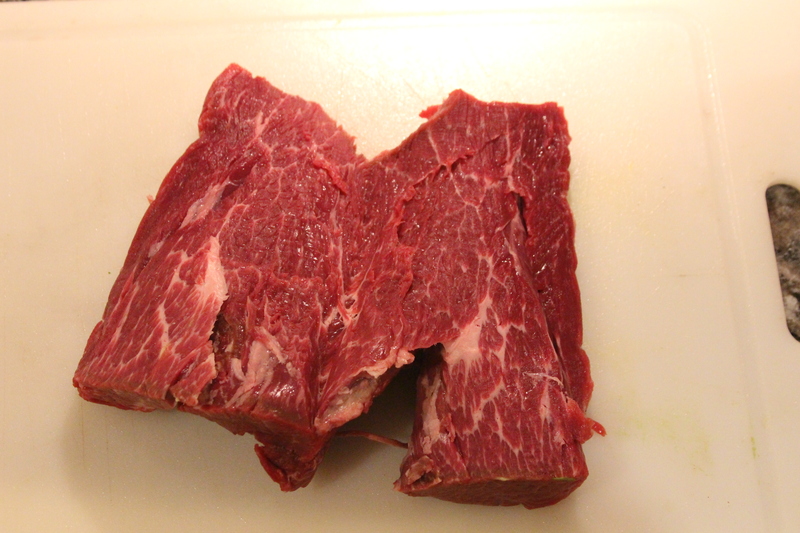 The meat had a nice sear and was perfectly done to medium rare. 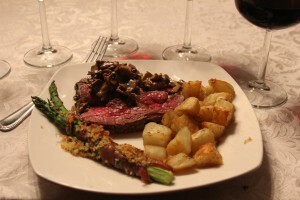 The meat was wonderful and the blue cheese added a depth to the flavor. It may not have been necessary but was beautiful. The mushroom ragout is a riff of our usual mushroom preparation. The recipe come from Fine Cooking (http://www.finecooking.com/recipes/porcini-cremini-mushroom-ragout-sauce.aspx). The only real difference from our “standard” was the use of Marsala wine and addition of a little thyme. Because they were available, we used hens-in-the-wood, brown oyster, yellow oyster, shitake and rehydrated porcini mushrooms for the dish. ‘Smrooms and heavy cream- what’s not to love. The roasted potatoes followed a recipe from the current Cook’s Illustrated magazine (https://www.cooksillustrated.com/recipes/8342-duck-fat-roasted-potatoes). The potato chunks are briefly boiled in salt and baking soda to brake-down the surface pectin and develop the surface starch paste. The potatoes are then mixed with duck fat (!!!!) and roasted in a hot oven for about 30 minutes with turning half-way through. Seasoned with salt, these were outstanding and may have trumped the meat (although Sandy, who is not a fan of duck fat, declared them just OK). The prosciutto wrapped asparagus bundles (http://www.foodnetwork.com/recipes/michael-chiarello/roasted-asparagus-bundles-wrapped-in-prosciutto-with-seasoned-bread-crumbs-recipe.html) were good. The addition of a more complicated breading and the addition of the prosciutto was tasty but tasters agreed that a simple roasted asparagus would have be as good and less work. As was a surprise to no-one, both the cabernet and zinfandel went beautifully with the entire dish (and by themselves). Given my preference for zins and the Ravenswood Teldeschi in particular, I would give the nod to the zinfandel. Because of the grilled prosciutto and the seasoned bread crumbs, even the asparagus paired reasonably well with the red but really shined with the Riesling. 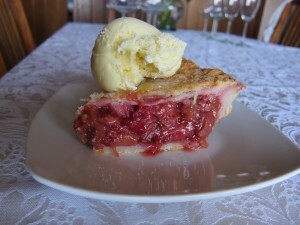 Given the season and intrigue with another Cook’s Illustrated recipe (http://www.cooksillustrated.com/recipes/8361-strawberry-rhubarb-pie? (http://www.foodnetwork.com/recipes/alton-brown/super-apple-pie-recipe.html). The other unusual aspect for the crust was its two refrigerated rests- one before rolling out the crust and one after. Since I didn’t have any vegetable shortening, I used cold butter for all of the fat. The dough was very moist and as a result needed a lot of dusted flour to keep from sticking but it also rolled-out and transferred to the pie pan dramatically easier than most recipes. retain a somewhat juicier consistency. The taste was superb and paired nicely with Luke’s homemade vanilla ice cream. 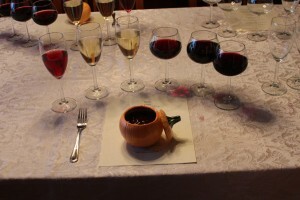 Given that the 2 drinkers had already sampled 6 wines, we elected to forgo the dessert wine. Although the evening did not rollout as planned, the dinner was a success.